Mix together the flour, salt, powdered milk, sugar, and yeast in a 4 quart bowl or in the bowl of an electric mixer. Pour in the egg, butter, and 1 1/2 cups plus 1 tablespoon water and mix with a large spoon or on low speed of electric mixer with paddle attatchment until all the flour is absorbed and the dough forms a ball. If the dough seems very stiff and dry, trickle in more water until the dough is soft and supple. Sprinkle flour on the counter, transfer the dough to the counter, and begin kneading or mix on medium speed with the dough hook, adding more flour if necessary to create a dough that is soft, supple and tacky, but not sticky. Continue kneading or mixing for 6 to 8 minutes. (In the electric mixer, the dough should clear the sides of the bowl but stick ever so slightly to the bottom.) The dough should pass the windowpane test and register 80 F.
Lightly oil a large bowl and transfer the dough to the bowl, rolling it to coat it with oil. Cover the bowl in plastic wrap. Ferment at room temp for 1 1/2 to 2 hours, or until the dough doubles in size (the length of time will depend on the room temp). Remove the fermented dough from the bowl and divide it in half for sandwich loaves, into eighteen 2 ounce pieces for dinner rolls, or twelve 3 ounce pieces for burger or hot dog buns. Shape the pieces into boules for loaves, or tight rounds for dinner rolls or buns. Mist the dough lightly with spray oil and cover with a towel or plastic wrap and allow it to rest for 20 minutes. For loaves, lightly oil two 8 1/2 by 4 1/2 inch loaf pans and place the loaves in the pans. For rolls and buns, line 2 sheet pans with parchment. rolls require no further shaping. For hamburger buns, gently press down on the rolls to form the desired shape. Transfer to sheet pans. Mist the tops of the dough with spray oil and loosely cover with plastic wrap or a towel. Proof the dough at room temp for 60 to 90 minutes, or until it nearly doubles in size. Preheat the oven to 350F for loaves or 400F for rolls and buns. 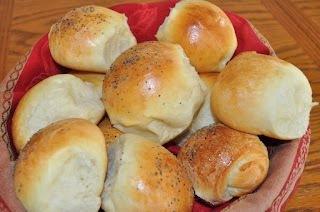 Brush the rolls or buns with the egg wash and garnish with poppy seeds or sesame seeds. Bake the rolls or buns for approx 15 minutes or until they are golden brown and register just above 180F in the center. Bake loaves for 35 to 45 minutes, rotating 180 degrees halfway through for even baking. Internal temp of loaves should be close to 190F and should sound hollow when thumped on the bottom. When loaves are finished baking, remove them from pans and cool on a wire rack. Rolls should cool for 15 minutes on a rack before serving.